Resistance during the Holocaust took place across a wide spectrum, and this seminar will work to create the broadest possible picture of this aspect of the history. We will also seek to make connections to issues that are relevant to contemporary teachers in California’s Bay Area. 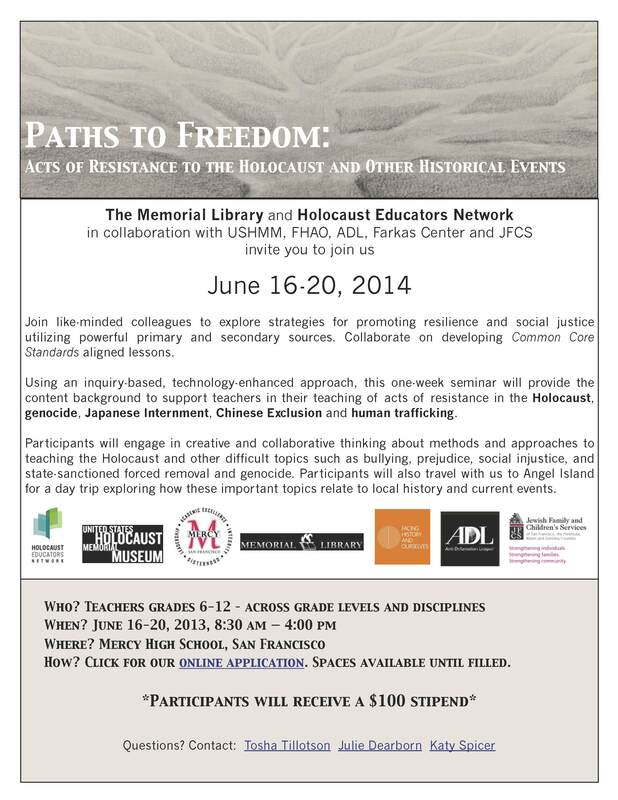 Our understanding of the Holocaust will inform our consideration of the treatment and exclusion of Chinese immigrants in San Francisco, and the later internment of Japanese Americans. For our students, this connection is important. Local examples of injustice help to minimize the distance between “us” and the “other” and can therefore aid students in empathizing with other groups. Because education can itself be viewed as an act of resistance, we want our students to recognize the common thread in discrimination–the limiting and even paralyzing view of the “other”–and to have the tools to recognize it and to effect change.